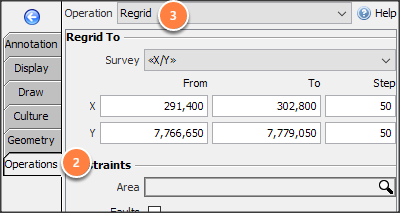 Use Regrid to convert a horizon to convert between surveys, or to a different spatial sampling. Where is the regrid operation? Note: The Regrid button is disabled if a horizon is selected in the map view that is waiting for another operation (such as propagation). Insight notifies you to complete the previous operation before continuing. Regrid is found in the Map View, under the Operations tab (along with other horizon operations). In the navigation bar, select the horizon to regrid. To create X/Y grids, select <<X/Y>>. 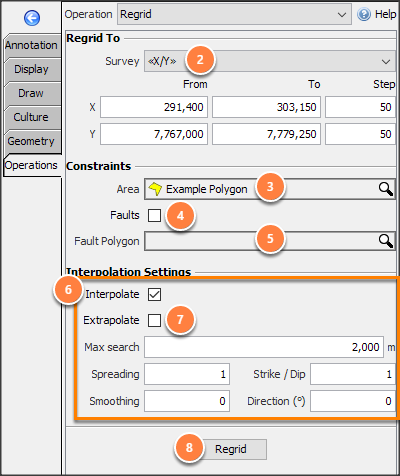 To create IL/CL grids, select the 3D survey. To create horizons on 2D lines, select the 2D survey. For gather horizon, enter the gather domain values. Enable Faults to prevent the regridding calculation from crossing fault planes. Fault Polygon: Exclude the area inside the selected fault polygon. Extrapolate: If selected, enable extrapolate to completely fill a specified region according to the settings. Note: By default, the new horizon will be named: “Well Marker: marker_name (domain survey)”. For example, the operation above will yield a new horizon called "Well marker: Sand_B5_base (TVDSS (m) IL/CL)". To rename the horizon, see Horizon Details and Configuration.